Six-Sigma-Material.com has partnered with Lean Sigma Corp. which offers accredited, online, self-paced certification programs. Compare these to other reputable, accredited courses with a certification test, usually cost at least $1,000. Click below on the options to learn more....and a free trial membership to this site. A subscription provides complete access to Six-Sigma-Material.com, special offers, free downloads, an option for your own page, and more. There are hundreds of pages explaining various Six Sigma tools and topics with monthly updates to existing topics or new topics altogether. Click here for more information. There are >100 sample certification problems available for subscribers, along with various free downloads within the site for subscribers. Learning all of the Six Sigma material through any certification course or tutorial can be overwhelming and challenging. Not familiar with Six Sigma? Click here to learn what many CEO's and others are learning and adopting for their companies. Thoroughly understanding the array of continuous improvement tools, their value, and meaning takes more time and application than a course allows. This material is presented in a simple format to help comprehend the basic principles in smaller lessons. This site is also designed to help those use their training and skillsets to find a career. Click here to locate job openings related to Six Sigma. This website will provide clarity and knowledge of each step of the process through the use of visual aids and roadmaps. Understanding the basics is essential prior to leading a team as a White Belt, Yellow Belts, Green Belt, Black Belt, Master Black Belt, or any other type of continuous improvement leader and project manager. The tools provide the project team with guidance; they will not directly improve the process. Proper employment of the tools will guide critical decisions and monitor control. Understanding when and which to apply will accelerate project execution. The methodology is disciplined and structured; it is a system. There are frequent applications of statistical tests but being overly number bound has its limitations, the results of statistical tests should be checked and balanced with reason. Much of the traditional emphasis of quality improvement and continuous improvement programs is placed on waste reduction and shifting process performance toward a target. The Six Sigma methodology strives to achieve more...and sustain the achievement. It is a collection of these tools, applied in a systematic manner, combined with an additional emphasis on variation reduction for process and product improvement. 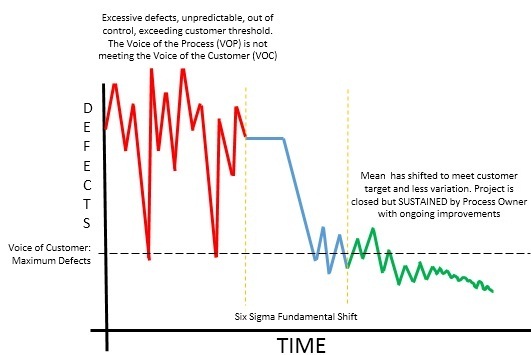 Six Sigma is a business management strategy for which its foundation is typically credited to engineer Bill Smith at Motorola in 1986. The program picked up momentum through substantial gains from another engineer, Jack Welch Jr. while serving as CEO of General Electric. A Six Sigma program within a company creates its own infrastructure. The CEO and Board of Directors are at the highest level of a corporation. They have decided to embrace and implement the methodology in their company. Upper Management representative or Vice-President of Six Sigma They are responsible for all the inputs and outputs (profits related to Six Sigma projects) of the program reporting to the CEO. Master Black Belts (MBB) report to the VP of Six Sigma and are the highest level of "belt". Some may specialize in DMAIC, DFSS, or both methodologies but they are subject matter experts in six sigma material usually with advanced statistical knowledge. Companies that focus a lot of resources on research and development may be more interested in DFSS experts. Those that are process oriented may have a need for more DMAIC experts. MBB's may lead some projects that are very large in scope with a high impact to the organization. They are also responsible for teaching programs, development of materials, and the Six Sigma certification program. The MBB's are the high level teachers of the Six Sigma methodology, as well as Black Belts. The effectiveness and use of the tools is a reflection of an organization's teachers. When the learners haven't learned, the teachers haven't taught. The proper application of the methodology starts with the MBB's. Champions or Sponsors are leaders trained to select and prioritize Six Sigma projects that deliver the goals and objectives of the company. 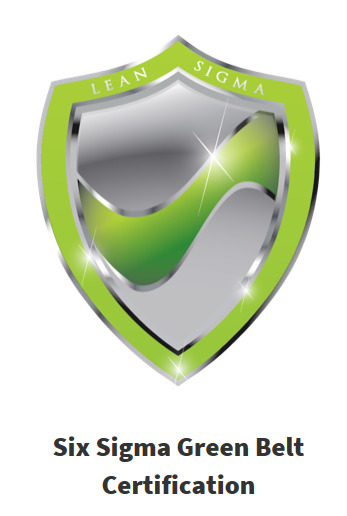 Champions will select and mentor Six Sigma project leaders such as Black Belts and Green Belts. Champions are frequently engaged in the beginning of DMAIC and DFSS projects in the Define phase to ensure the scope is being maintained and going in the right direction. Black Belts work for the MBB. They are usually full time Six Sigma employees carrying out the duty of a change agent. Black Belts work projects smaller in scope than the MBB but larger than the Green Belts (GB). Black Belts are also be subject matter experts and will often conduct training, mentoring, and develop new six sigma material. Often they will lead a team that has Green Belts as team members, but are not required. It is more important to engage critical stakeholders of the project that are willing to accept change and participate. With cross-functional representation the subjective component of the methodology will add more value. Black Belts have usually been selected as high caliber talent and capable of leading transformation. The technical skills are half of the skillset, being able to change the culture and manage the project is the other. Green Belts often lead projects themselves, and normally have an assigned Black Belt as a mentor. These teams may have other Green Belts and also include stakeholders such as operators, supervisors, human resources, finance, and anywhere else in the company. Anyone with a stake in the outcome and is willing to participate can be on the team. Green Belts often continue to hold their existing job and responsibilities while leading a project. Yellow Belts typically go through about 15-20 hrs of training and an exam. At this secondary level are the introduction of metrics and basic improvement methodologies. 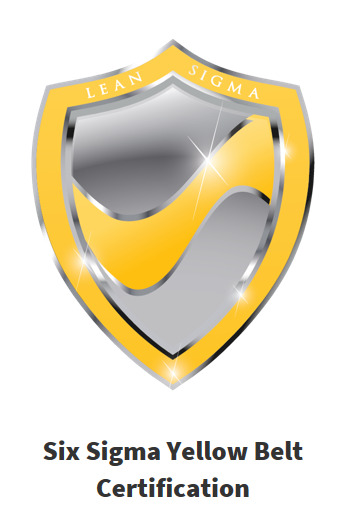 Yellow Belts retain their existing job and participate on Six Sigma teams as needed and will have responsibilities from data collection, waste identification, to basic statistical analysis. White Belts are trained in general principles of Six Sigma and Lean Manufacturing. Certification usually requires one day of training and an exam. When this level exists within a company's Six Sigma infrastructure it is considered the first level. White belts become accustomed to the structure and format of a DMAIC or DFSS project. Six Sigma "Belts" are often thought to be those with engineering backgrounds. While there are many that succeed due to their statistical background it is certainly not the requirement. In fact, each company should train a wide variety of backgrounds as their change agents to lead the company on the Six Sigma journey. Candidates should come from human resources, finance, clerical, operations, sales, marketing, quality control, engineering, production control, purchasing, supply chain, R&D, maintenance, and any other department within an organization.